With the Trailblazers effectively winning Greg Oden (I know some people think they might take Durant considering that they already have some size with LaMarcus Aldridge, but considering that every dynasty in NBA history that didn’t have a guy named Michael Jordan was anchored by a dominant center, I can’t see how Portland isn’t taking Oden), Brandon Roy, who was the team’s representative in lovely Secaucus, got a ton of airtime. This brings to mind the headline for my post the day before last year’s NBA Draft: “R-O-Y Spells Rookie of the Year for the Bulls” in an argument for the Bulls to pick Roy if they didn’t parlay the pick in a blockbuster trade for Kevin Garnett. Well, Roy certainly went on to win the Rookie of the Year Award but the Bulls ended up passing on him to grab Tyrus Thomas. I love Thomas’ defensive presence and freakish athleticism (I swear that he can jump up and grab the top of the backboard without a hitch), yet it’s pretty clear that Roy would have contributed a whole lot more pretty quickly, which would have been key for a club that (a) needs to make the most of its substantial financial investment in Ben Wallace as soon as possible and (b) could have done it in a year where you would have found better competition on an average night at Rucker Park than the Eastern Conference. Instead, the Bulls got bounced out of the playoffs again, while Roy is going to be paired up with Oden in what might very well become the next great NBA duo along the lines of Michael and Scottie, Shaq and Kobe (in happier times), and Magic and Kareem. I’m not saying that Roy would have propelled the Bulls over the Pistons, but they certainly would have had a better chance considering that he’s a go-to scorer and the team from the Chi shot around 35% from the field in each of their round 2 losses. Speaking of the hapless Eastern Conference, it figures that the top two franchise players in years are going to both end up on the West Coast to further cement the inferiority of the collection of teams east of the Mississippi River. At least we’re not going to get many “David Stern frozen envelope” theories out of this draft – I can’t imagine that the NBA would have wanted the balance of power in the league to tip even further to the West. 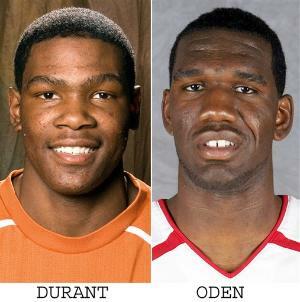 I’ll have to say that the Blazers and Sonics fans are two constituencies that can argue that they truly deserve the next superstars of Oden and Durant. Even though they aren’t located in the marquee media markets of Chicago or Boston (more on them in a moment), at least basketball fans didn’t have to suffer through the indignity of one of these stars toiling away with franchises such as the Grizzlies or Hawks (who dodged a huge bullet since if they drew anything lower than the #3 pick, which they got, would have resulted in losing their first round choice to the Suns). Sure, the Sonics seem bent on leaving Seattle, but that’s because of the ludicrous transfer of ownership there as opposed to the lack of a fan base. I still don’t buy that they’re heading to Oklahoma City, even though that town showed great support for the Hornets. In a perfect world based purely on the viability of markets, the Sonics would stay in Seattle (too large and wealthy of a market for the NBA to leave) and then Las Vegas and Oklahoma City would respectively get the Grizzlies (Memphis just can’t sustain that franchise) and Hornets (politically incorrect to move them in the relative wake of Hurricane Katrina, but New Orleans wasn’t a good NBA market way before the levees ever broke). Hopefully, the star power of Kevin Durant is to spark a greater movement to keep the Supersonics where they belong in the Pacific Northwest. While watching the Bulls get the expected #9 pick prompted an internal “Oh well, what can you do with those odds?” response from me, I audibly gasped with no one around me when I saw the Celtics come up at #5 – the worst possible position that they could have ended up with. Now, it’s hard to have much sympathy for the most successful franchise in NBA history – this would be akin to a lot of the intimations that UCLA is “due” on the college basketball side for not winning a national championship in (OMG!) over a decade. That being said, Bostonians are home to one of the few groups of fans from a particular city that I have great respect for (to me, Chicago, Detroit, Boston, and Philadelphia are the standard-bearers for across-the-board fandom, as opposed to, say, the single sport obsessions of St. Louis with the Cardinals or Green Bay with the Packers), so while places such as Memphis will move on from this evening with nary a scratch, I feel a little tinge of sadness that the 2007 NBA Draft Lottery will be vividly remembered as yet another infamous event in Beantown sports history to be included with Len Bias, the Tim Duncan draft, Bill Buckner, Bucky Dent, etc. Of course, since the Red Sox are the best team in baseball and the Patriots look like a force again with the thought of Tom Brady tossing it deep to Randy Moss next season, no one should cry too much for New England. So, this gets to the most prominent question on my mind: what should Bulls do this offseason? If you recall my thoughts during the Final Four, I stated the following: “Lord help me if Joakim Noah ends up in a Bulls uniform.” Well, the Bulls have the #9 pick and I probably don’t have to tell you who the authoritative NBADraft.net projects at that spot right now… just drop a piano weighted down by an anvil on my head if this happens. All of the Chicago media prior to the lottery today had reports of Bulls general manager John Paxson’s comments that seemed to give the impression that he wasn’t interested in moving this year’s pick, even assuming that it would end up at the projected #9, or making many changes to the team. I really hope that this is just a display of Paxson coyly keeping his cards under wraps before making a monster move, but I really fear that the Bulls are just going to go through the motions of the draft and make a few changes around the edges without taking any risks for greater success. I have stated before that I enjoy the effort and hustle of the Bulls team as presently constructed, yet also made it clear that simply having great character guys isn’t good enough for me – I want more NBA championships. Therefore, if that means that we need to take a risk with a guy that might not necessarily fit into the team’s “culture” on paper, then so be it.The last thing we need is a solid-but-not-game-changing young player (i.e. Joakim Noah) – it’s time for a trade for a cornerstone guy that should have been executed a year ago. Of course, that’s a whole lot easier said than done. Kevin Garnett would obviously fix all of the Bulls’ problems, but the Timberwolves GM Kevin McHale seems to be on the opposite end of the spectrum from Paxson, where he’s so obsessed with keeping his star that he refuses to make changes that would get more wins overall. Pau Gasol’s name is constantly tossed around as being the next Bull and he would certainly provide the low-post scoring presence that the team sorely lacks, yet I just don’t get the heart-fluttering feeling from him. That is, does Gasol really scare anyone outside of the fear of getting caught in his nappy neckbeard? I don’t know if that’s the case. The Bulls are already filled with highly-skilled players that opponents might respect but don’t necessarily fear. With all of this in mind and assuming that McHale continues with his stubborn refusal to move Garnett, the Bulls need to make a real move for Jermaine O’Neal of the Indiana Pacers. He’s not the prototypical Paxson type of guy, which is exactly what the Bulls need, meaning someone with a real edge. Granted, O’Neal needs some help on the mental front with his supposed desire to join Isiah Thomas and his cesspool Knicks franchise, but I think if he’s presented with the opportunity to latch onto a Bulls team that would probably become the best team in the Eastern Conference and a true championship contender next season with his presence, he’ll pass up Broadway for the Madhouse on Madison. He won’t come cheap, but if the Bulls offer Larry Bird and the Pacers Ben Gordon, Tyrus Thomas, and the #9 pick in this year’s draft, I think (a) it would be enough of a return for the Pacers for this to be a justifiable trade and (b) the loss of an outside scorer in Gordon would be more than tempered by the prospect of giving Luol Deng and Kirk Hinrich more freedom to roam the perimeter with O’Neal as a top-tier scoring option down low. All in all, it turned out the NBA Draft Lottery wasn’t the instant solution for the Bulls. Greg Oden and Kevin Durant, not to mention LeBron James at a mere 22 years old, are going to be in the NBA for a very long time. As a result, John Paxson can’t be lulled into thinking the Bulls as they stand today are simply going to keep progressing in a linear fashion – I have serious reservations as to how much better this team can get. While Paxson made a bold move in signing Ben Wallace last summer, this offseason is going to require an even bigger splash in order for the Bulls to really be in contention for another ring. UPDATE: For the record, Nick Collison is definitely not my idea of bold move by the Bulls. For what it’s worth – and that’s not much – there’s a strong buzz here today that the Wolves front office folks have holed up in their conference room. I guess this happens once every five years or more. The word is that they’re talking trade. Speaking of the T-Wolves, at what point does a flameout career of an executive or coach begin to totally overshadow a great playing career for that same person? Isiah Thomas is at the top of any reasonable discussion of the best point guards ever and the centerpiece of back-to-back world championships, yet he’s been such an abomination as a GM that he might very well be remembered more for his awful personnel moves with the Knicks, Raptors and even the killing off of the CBA. Kevin McHale is similarly a Hall of Famer that has sullied his good name by becoming a piss poor executive – the way that the Wolves have failed to capitalized on KG, one of the greatest basketball talents of his generation, is pathetic. MJ and Magic had pretty abysmal stints as GM and coach, respectively, but I think they went to more ceremonial roles quickly enough to avoid too much of a permanent taint. I just wonder what the tipping point is here. By the way, it’s amazing how many Celtics fans are saying that the results of last night’s lottery were rigged by David Stern to punish them for tanking. That’s absolute nonsense – if there’s one franchise that NBA league executives wanted to win last night, it would have been the Boston Celtics by a landslide. Plus, with the Western Conference already stacked in comparison to the East, the fact that the next two superstars of the league went to two relatively small market teams in the West is the ultimate sign that there was no way that this was rigged. If there was a rigging, the results would have been (1) Boston, (2) Chicago, (3) Philadelphia, and (4) Phoenix (via Atlanta), since that would have been by far the most optimal scenario for the league’s business interests. The lottery was completely clean last night. Maybe that’s what they want you to think… They sacrificed Oden and Durant to draw you off the scent from the Ewing draft. Or, maybe Oden is just too ugly for a major market. Can you imagine him being on the cover of USA today every morning? Wait, does Portland have some sort of Sasquatch breeding facility? Oden isn’t necessarily a looker, but let’s remember that Patrick Ewing – the first cover boy for Fugly Magazine – ended up in the biggest market of them all. ROY as R-O-Y and Morrison “Bad, Very Bad, Radioactive” … MJ obviously didn’t read you that day. I like O’Neal with the Bulls, but Gordon, TT, and #9 are too much to give up. J.O. is just 28, but he’s an 11-year vet who’s missed the equivalent of a full season over the past 3 years. I just can’t imagine him lasting many more years. You’ll like this – it’s NBA-related. That’s the most I’ll think about the NBA for the next two years. Stuck in the Middle with A.J.